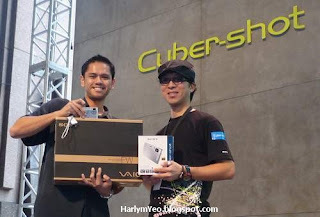 The 'colourful' Sony models are posing with Taku Taguchi; GM - Product Marketing Division of Sony Malaysia (2nd from left), Yosuke Aoki; Assistant GM - Handycam Marketing of Sony Marketing Asia Pacific, and Naoi Sudo; MD of Sony Malaysia (2nd from right) and Mitsuhiro Shimada, Senior Manager - Cyber-shot & Printer Marketing of Sony Marketing Asia Pacific (3rd from right). 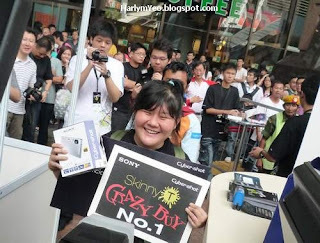 KUALA LUMPUR, 27 September, 2008 – Sony Malaysia expands its line of Cyber-shot™ cameras with the launch of Cyber-shot™ Skinny T (DSC-T77) here in Berjaya Times Square. This sleek and stylish-lovely gadget measuring just 13.9mm wide is the slimmest Cyber-shot™ family to incorporate the Super SteadyShot™ optical image stabilizer. 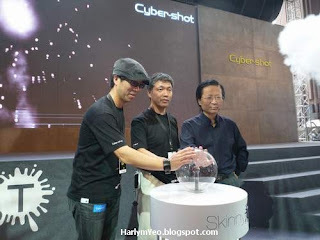 In conjunction with the launch, Cyber-shot™ is offering 350 units of the latest Skinny T at Crazy Buy with unbelievable price tags strating from RM8 (for the 1st to 10th customers). 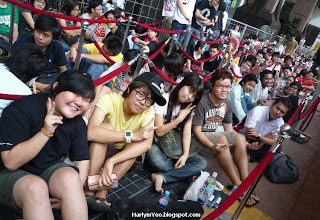 This offer has attracted a sea of crowds, with some lining up even as early as 25th September in a race to own a unit of the latest Skinny-T.
"I came with 3 other friends all the way from Cyberjaya to line up as early as 7:00pm on Thurday, 25th September," said the first Skinny-T customer, Fam Xiao Ying. This 20-year old Multimedia University student picked brown colour Skinny-T as it reflects unique personality. 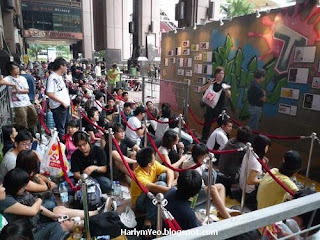 In conjuction with the launch, Sony also announced 10 winners of Skin Design Competition. The grand prize went to Hafiz Zamri, 29, a KBU lecturer in graphic design. Skin design masterpiece done by Hafiz. 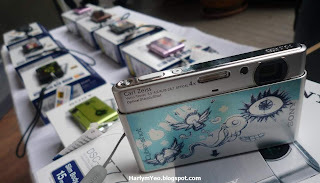 This latest piece of art from Cyber-shot™ Skinny T (DSC-T77) packed cutting-edge technology such as enhanced Smile Shutter, Face Detection, and Intelligent Scene Recognition for optimum camera experience. 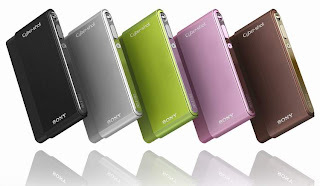 It is now available in black, silver, green, pink and espresso at a retail price of RM1,299.00.